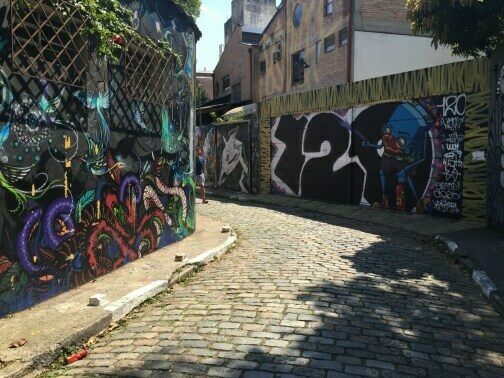 In a city full of graffiti and street art, no place is more impressive than São Paulo’s Beco do Batman (Batman Alley), an open air gallery of street art that started with a simple picture of the titular vigilante. The first model village in Brazil, built in 1917 to house workers at the jute sack factory. Beco do Batman is an area near Vila Madalena in São Paulo where three alleys meet. Every inch of wall at the dense urban crossroads is covered with graffiti and the pieces even extend down onto the sidewalks. Well known street artists from not only Brazil but also other parts of the world are attracted by this sanctuary of graffiti and come to make their marks, however transient they may be. The street art tradition at the location started in the 80s when the first drawing, one of DC Comics superhero Batman, appeared. Soon more was to follow with fine-arts students painting cubist and psychedelic images along the long walls. Soon Beco do Batman was completely covered in bright, stylized spay paint art. Today the area is continues to exist in a state of flux, with old pieces disappearing as new paintings are created on top of them, always with the previous artist’s permission. The ever-changing look and feel of the site makes every visit to Beco do Batman a new and exciting experience. The closest metro station is Sumaré on the green line. From there it's possible to walk along Av. Paulo VI and then along the north side of Cemitério São Paulo and turn right. It's also possible to reach the place from Fradique Coutinho Metro Station (yellow line). Batman's Alley is the nickname for the area around Rua Gonçalo Afonso and Rua Medeiros de Albuquerque. Please be mindful of visiting this residential area. Last year, the buzz and mess in front of some residences were so intense that some residents started painting the walls gray as a form of protest! If walking on foot to the area, watch your step as much of the pavement is irregularly placed or falling apart and is incredibly slippery when it rains. It's a wealthy area of the city, so almost everyone drives, making pedestrian safety a low priority.